May/June 2018 print issue of Concrete Homes + Low-Rise Construction Magazine. Yes, castles in today’s world frequently host tour groups. But most tour groups aren’t touring private homes in the United States! 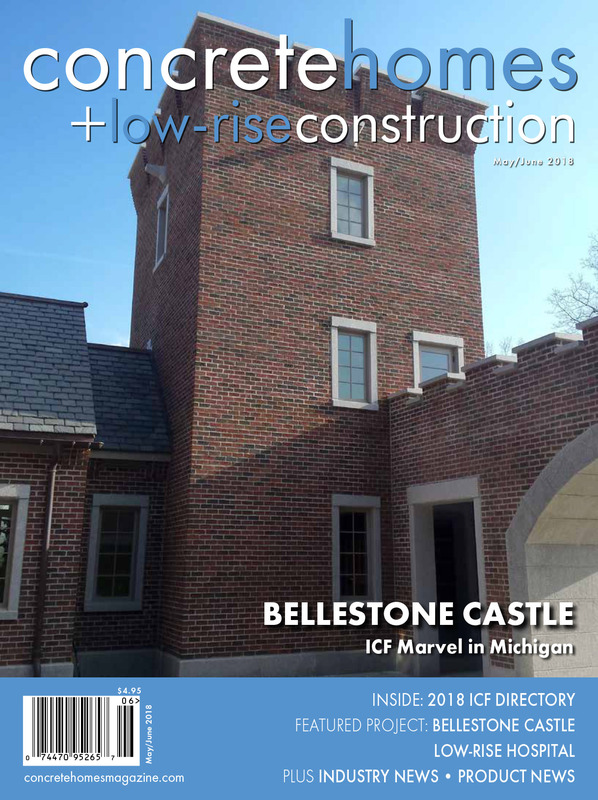 The home of Michael and Sue Drew, a private residence in eastern Michigan, hosts tours of people curious about how he built his “castle” from ICFs. That attention the project is bringing to ICFs is just one of the reasons that the Drew castle was first runner up in the 2018 ICF Builder Awards in the residential category. Armed with a list of needs, Drew embarked on managing the work and trying to educate people about ICFs where necessary. For instance, the electricians had not worked with ICFs before and were unsure about proceeding. Drew ended up cutting out all of the channels and holes for the electrical boxes and cables himself because they’d never done it. “It took a little longer but I got it done,” he says. In 2011, the Drews were ready to build on their 46-acre property that was formerly a Christmas tree farm with several low-lying wet spots. Their original plan was for a small, cottage-sized Frank Lloyd Wright-inspired design. Drew first began digging ponds for dirt to build up a berm at the road in front of the property and for fill around the house to create a basement. In the middle of this process, the township passed an ordinance stating that in order to have a pond the house had to be a minimum of 1,000 square feet. The Drews had paid an architect to design a Frank Lloyd Wright-inspired house, but they just didn’t feel that it fit on the property. Those plans were designed with ICF in mind. After seeing the Tyree designs, the Drews decided that their new home would be a castle. The traditional features of a castle, the courtyard in particular, were one of the things they both loved. The Drews also worked with Scott McElrath, president at Dangerous Architects, a local Michigan-based firm that helped them add some lower-floor windows and meet some Michigan building standards. McElrath also drew up plans for the granite that the Drews wanted, including an 80,000-pound main arch. All totaled, the Drews brought in some 572,000 pounds of granite in 13, 20-foot long containers. With that decision made, the Drews had to turn their attention to the site. The water table is only 16 inches below the surface and they knew they wanted a full basement, because Michael grew up in Illinois with a house that has a basement tornado shelter. Tornadoes are sometimes a concern in this area of Michigan too, so they wanted that extra security. They built a berm with 45,000 cubic yards of dirt dug up from the four ponds they created. The 9,000-square-foot castle has a total of four bedrooms, five full baths, two powder rooms and one 3/4 bath. The first floor holds the heated three-car garage, mud room, first floor laundry, 3/4 bath, landing, kitchen, butlers pantry, one powder room, entry hall, dining room, great room, library, garden room, passage and a second powder room. The first floor of the tower is a billiards room. Over the garage is a blue-themed guest bedroom, a second laundry and a green guest bedroom. The second floor of the main house has a craft room/third guest bedroom and the master suite which includes his-and-hers walk-in closets and separate baths, the master bedroom, master bedroom sitting room and a bar on the second floor of the tower. The third floor of the tower is an office. Quarter sawn white oak is a predominant theme in the interior, with most rooms featuring abundant wood trim. With so much space to work with, each of the three guest bedrooms includes a small kitchenette, similar to a small kitchen area you would find in a hotel. The rooms were so large, that including some extra luxuries just made sense. And when the in-laws visit, everyone has their own private space and the whole family isn’t all reaching for the coffee pot at the same time. One of the guest bedrooms also has its own custom granite fireplace and a huge walk-in linen closet. When there are no guests, the guest wing can be closed off, so the family can save on energy costs. The second-floor master bedroom suite can only be found if you know where to look for the entrance, which is hidden by a bookshelf door that blends into the rest of the bookshelves that line the hallway. A Jack and Jill bathroom there is matched by walk-in closets. Naturally, the bathroom features every luxury, including custom granite shower bases, sinks and matching bathtub designs. The sitting room features a beautiful fireplace with large windows and another small kitchenette. Pre-fabricated bucks are designed for direct contact with concrete and are non-corrosive to metals. Pocket shutters, clever carpentry that allows for the shutters to fold into a pocket built into the window casing, are something you see on old English buildings. The home’s basement utilized 8-inch ICF block, which changes to 6-inch block for the first and second floor. If he had used 8-inch block all the way, he could have had the real pocket shutters, but it would have been more expensive. That turned out to be one of the few things that Michael Drew regrets about the design of the home. The build also included other interesting things, like the use of top chord bearing floor trusses that sit on angle iron that is held to the ICF by J-bolts. Top chord bearing open web trusses are used to support the first and second story floors. The open-web trusses allow pipes, wires and HVAC ducts to pass through without having to cut out channels. The exterior was finished with brick and granite. In true castle fashion, 140,000 pounds of 1/2-inch slate covers the roof. As per “The Slate Roof Bible” book, the slate must be nailed, using copper nails, into solid lumber at least one-inch thick. Treated lumber was chosen for the roof deck. Michael waited for it to go on sale at Menards then ordered 16,363 linear feet, over three miles, of 5/4 treated decking. “The salesman was very amused when I walked up and ordered three miles of their decking!” Drew says. Copper nails are compatible with treated lumber as treated lumber nowadays mostly contains copper. He has an insulation value of R98 in the roof under the slate. Since energy efficiency was important, they used HRCS for ventilation and geothermal heating and cooling. For the geothermal, Drew pumps out well water at about 50 degrees, takes the heat out of it and dumps that water back into one of the ponds. “They are awesome air conditioners and you don’t have an ugly, noisy thing sitting outside your house,” he says. “In the wintertime it’s ok but not super energy efficient because it’s such a big house. If I had it to do over again I would do geothermal for air conditioning but forced air with gas for the heat because geothermal are not as efficient as heaters.” The initial house plans didn’t call for any solar, but Drew considered it and may include some solar features in the future.